It’s clear big change is needed at Manchester United after a nightmare start to the season that sees the club already making up ground in the Premier League title race and out of the Carabao Cup in the third round. The Red Devils surely cannot take one of the big prizes on offer this year without a major shake-up, and that has to start with the manager. Jose Mourinho is not what he once was, with the game changing a great deal since he first established himself as one of the finest coaches in the world. That style of defensive football and harsh man-management is now majorly out of fashion and the Portuguese has been unable to adapt, with Zinedine Zidane – widely linked with the United job as his replacement (and Spanish source Diario Gol suggesting it could happen very soon) – surely a far superior option after his tremendous work at Real Madrid. But a change in manager will also surely mean more changes in personnel – with reports (from the Guardian among others) of a director of football being hunted by the Red Devils to fix some poor recent decisions in the transfer market. It’s time to accept it’s just not happened for Alexis Sanchez at Manchester United, and with the player being the age he is after the tireless career he’s had, we simply can’t see him getting back to the level he once was any time soon. CaughtOffside have also previously been told that Sanchez would be unlikely to feature in Zidane’s plans, due to the French tactician having never really rated the player, and even less so now after his struggles in Manchester. This makes sense as Real Madrid seemingly had a chance to sign the Chile international while he was still at Arsenal back in January, with Zidane vetoing the deal, according to Don Balon. 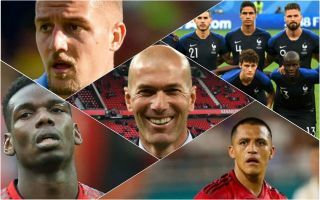 Some fans will no doubt be disappointed to see Sanchez go after his arrival caused such excitement, but it would seem other big-name attackers feature in Zidane’s plans. Eden Hazard to Manchester United under Zinedine Zidane? Man Utd fans - how would you feel about a Zidane-Hazard dream team? Eden Hazard being linked with Real Madrid while Zidane was in charge was something of a common theme, and Don Balon now claim the former Los Blancos boss wants the Belgian at United. As shown by his masterful solo strike against Liverpool last night, Hazard is at the top of his game right now and one can only imagine how good he could be in this star-studded United side managed by a man he’s publicly described as an idol. The 27-year-old would surely be the Sanchez upgrade the club needs right now, and the signing may not be as unrealistic as it looks due to his contract situation at Stamford Bridge. Hazard’s current deal expires in 2020 and that could mean he’ll be available for a cut-price fee like old team-mate Thibaut Courtois was this summer if he does not put pen to paper on an extension soon. A no-brainer really. As much as Antonio Valencia is rightly loved by United fans for being a great servant to the club, they simply have to aim higher if they are to move forward. The Ecuadorian was never really a natural right-back anyway, though he’s done his best to adjust to the new role and will undoubtedly be fondly remembered by supporters at Old Trafford. Still, he’s 33 now and a younger, elite-level signing is needed in that position – with clubs like Manchester City and Liverpool showing just how important fast, energetic and skilful full-backs are in the modern game. Speaking of which, United should surely look no further than Benjamin Pavard as the man for that job. The 22-year-old was immense for France as they won the World Cup last summer, and it’s hard to imagine a better option in that position for the Red Devils. He has unsurprisingly been linked with other top clubs around Europe, but if Zidane gets the United job it shouldn’t be hard persuading the youngster to pick Old Trafford over other offers. A player out of his depth for some time at United, it’s time to let the lovable Phil Jones go and play for a mid-table Premier League club where he belongs. It’s quite remarkable how long MUFC have gone without making serious changes in defence, and cutting loose some of these sub-standard options in their squad has to be the start of that rebuilding process. One of the best centre-backs in the world, Raphael Varane is precisely the kind of player United should aspire to have leading their back four. Still with his best years ahead of him, the France international could be a great long-term solution for Zidane’s side if he gets the job, and Don Balon have already claimed he’d target his fellow countryman if he joins. CaughtOffside were also told that United held talks over a potential big-money move for Varane this summer, though it never worked out. Like Valencia, Ashley Young has won lots of fans for reinventing himself admirably as a full-back in recent years, but of course the club has to aim higher. Luke Shaw has started this season well, surely cementing his place as the new first choice at left-back, and it’s been a long time coming. Linked with a host of top clubs in recent times, Sergej Milinkovic-Savic looks ideal for a new era at United, with more craft and creativity needed from deep in their midfield. We’re not advocating getting rid of Paul Pogba, with Zidane’s arrival perhaps ideal for the club in persuading the unsettled Frenchman to stay put amid growing talk that he is desperate to leave for Barcelona (as reported by the Daily Mirror and others). Yet another hugely popular player at United, Juan Mata has never really looked like rediscovering his best form in a red shirt since his transfer from Chelsea in 2014. The Spain international no longer influences games like he used to, despite getting more than enough chances to do so under both Louis van Gaal and Jose Mourinho. More useful to United would be another player to come in to their front three, with Christian Pulisic perhaps an ideal candidate. The young USA international looks one of the top up-and-coming talents in the game and one who can fill a variety of positions, potentially coming in to an exciting new-look front three alongside Romelu Lukaku and Eden Hazard, as seen below. The Daily Mail have previously mentioned United as being among Pulisic’s many admirers, and we think the 20-year-old could be a superb long-term signing for the team to build around and to freshen up a squad that looks so stale at the moment. And like Hazard, one little bonus is that the youngster’s current contract expires in 2020 so he might not prove too expensive. Manchester United’s new-look XI under Zinedine Zidane?